We were all in shock when the trend hit in early 2017 and have been drooling over them since. 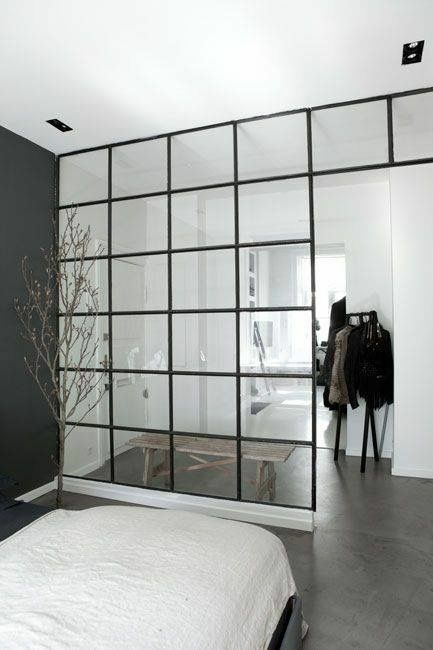 Black powder coated steel framed glazed partitions. In other words, those beautiful black framed window walls that we are seeing in interior spaces. After the swoon faded, I discovered a very practical issue with these walls… Arent walls supposed to separate spaces and provide privacy? Well, not these ones. The goal of these window walls are to separate zones in space without compromising on light, still maintaining the open feel of the space. To prove it to you, I have rounded up our top 5 favorite PRACTICAL applications for these. Interstitial spaces can be a pain to design. Often, they become this weird in-between space with no purpose other than to offer a transition in space. These glass walls offers a connection from the outside in, making a smoother and aesthetically pleasing transition. Anyone who has ever owned a studio apartment or condo knows the struggle of defining zones within a larger, open space. We have seen endless Ikea temporary hacks, but for those who are in it for the long run, this offers a solution that embraces your small space. Since the development of open concept, our clients have come to us with lots of noise control issues. Families are finding that noise carries through the house in unwanted areas. No one wants to hear the kids playing cops and robbers while you’re trying to make a work call in our home office. These glazing walls offer create barrier between spaces, blocking some sound, and separating quiet spaces like your office. It sounds contradictory to build a wall to open up the space, but this glazing wall offers a protective railing for the stairs without the cluttered, repetitive lines of balusters. 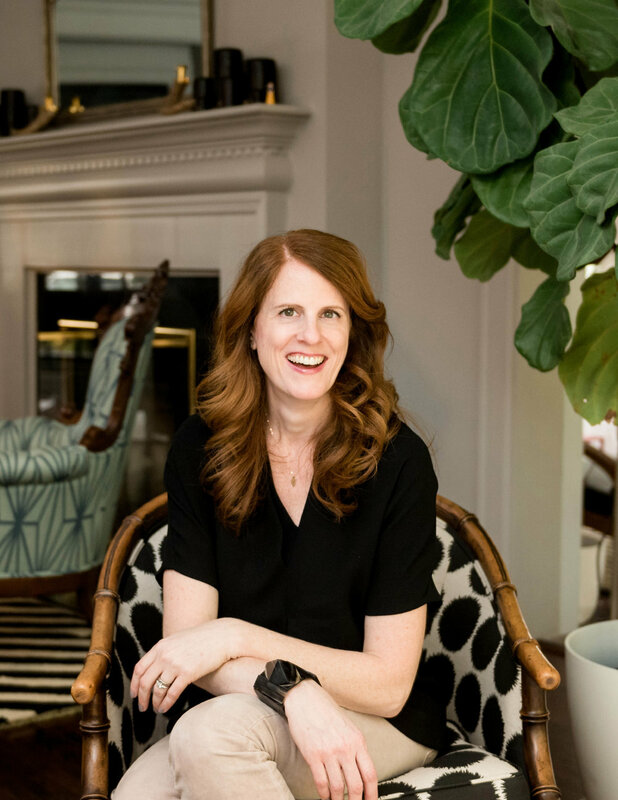 There are some spaces, like mudrooms, that unfortunately receive a lot of light as they are connected to the exterior of the home, but get VERY messy. Frosted glass partitions offer a way to carry in that light without seeing the mess! This can be a great solution for spaces like kids play rooms, pantries, offices, etc. 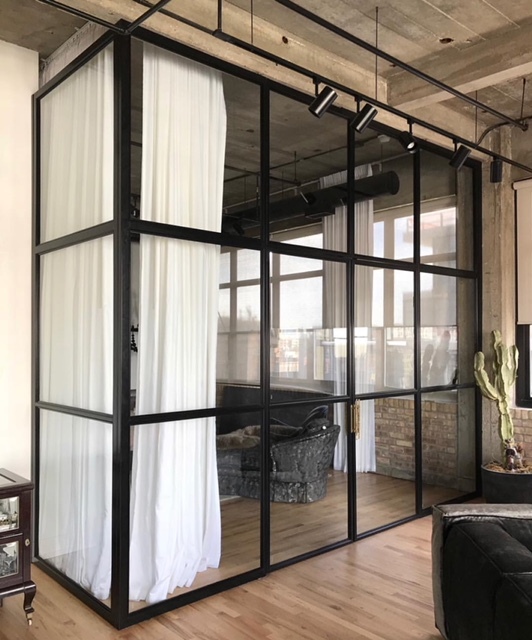 This is a steel and glass wall we did for a modern condo in the West Loop to split the master bedroom from the main living area. 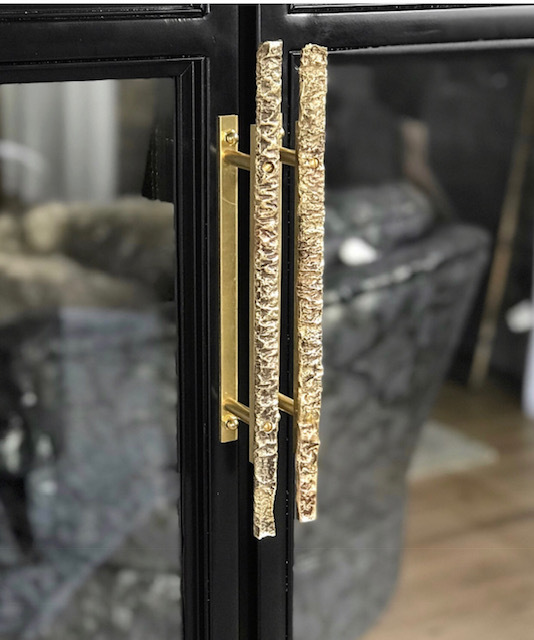 We also had custom cast brass door handles made. We are so excited about our recent install- we can barely contain ourselves. The space previously was a dated space stuck in 90's, with rounded walls and random suspension cable tracks lights. 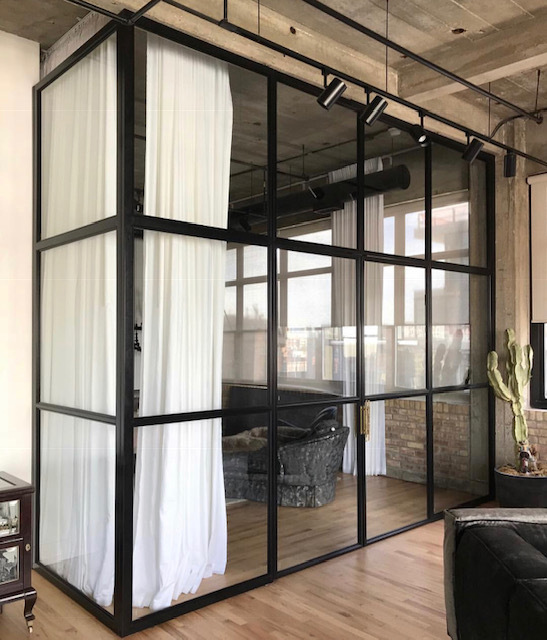 We gutted the loft, including every bathroom, ripped out the old gym style railing with a fresh clean modern version and replaced a curved wall leading into the master bedroom with a open concept steel and glass wall- punctuated by a dramatic white curtain. We still have yet to professionally shoot the space. Stay tuned that is slated for end of August! On October 31st, many Americans were standing on each others door steps. Accompanied by our children, doorstep-to-doorstep ringing door bells and listening to our kids yell "TRICK OR TREAT!". As a creative person, I was paying as much attention to the costumes as I was the doors. After half a dozen of white and glass doors, I was pleasantly surprised with a bright yellow door. Everyone knows that the kids' favorite house on the block is the one that gives out the full size candy bars - but this one was my favorite. When thinking about design, people often get stuck on the soft goods. We think about the potential for a sofa, coffee table, maybe some chairs. Things like windows, trim, doors, and passageway areas are neglected. The bones of a space are just as important though! They hold the power in a room to pull everything together, and I think they deserve our designated attention. The options are endless when it comes to paint colors, finishes, and details though. Here are some of our favorite doors to help inspire you to give your home some character. If you are going for more of a natural look, one of my favorite wood options is Cypress. The long, rustic woodgrain although it looks very rough, creates balance in space to create the perfect rustic modern look. This door has a high gloss, lacquer finish. This finish is absolutely stunning! It is guaranteed to make your home stand out from all the others on the block. 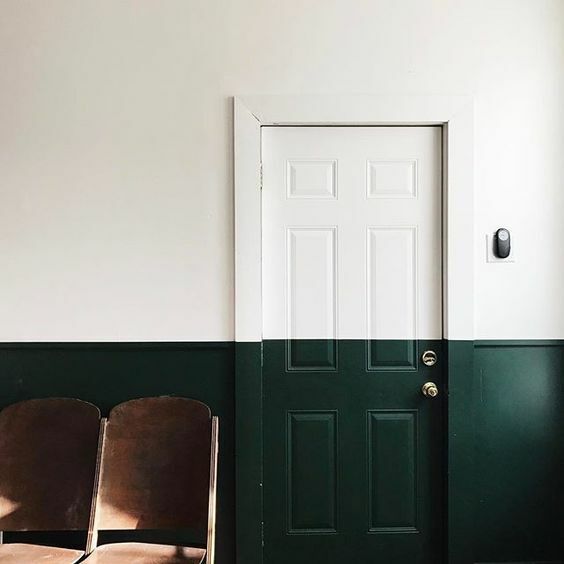 Not every great door has to be a bright color. Not every home calls for bright color. A white on white showstopper may be the perfect way to give your door some much needed texture and character. 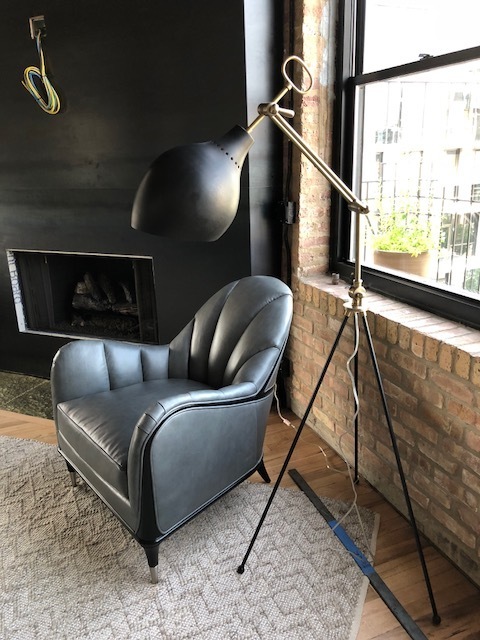 The antique look isn't for everyone, but I believe that antiques bring character into a space that some contemporary design cannot replace. 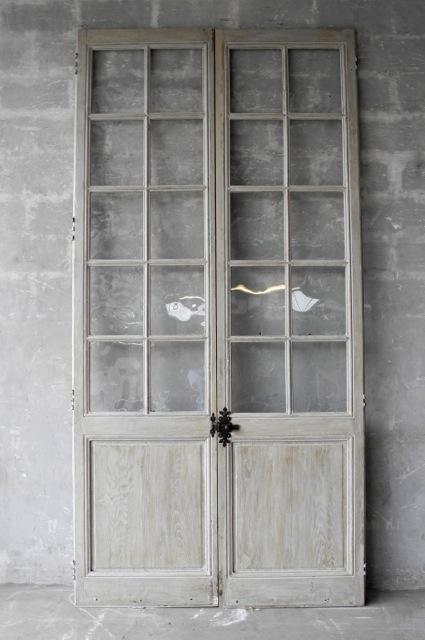 There are some amazing dealers out there that sell beautiful doors like these to implemented in a modern home. Maybe you are looking for a more bold move. 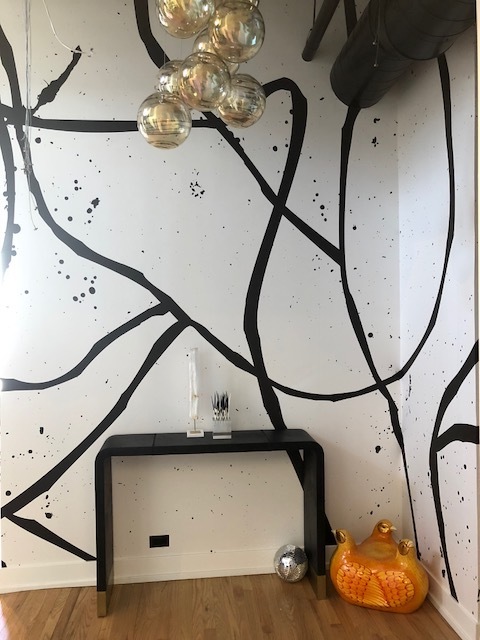 Consider these unique door painting patterns. It doesn't need to be all one color! Did this for a clients tween bedroom, mixed with black and white checked head board and leather pillows. This is a fun approach for a more temporary option, using Washi Tape to create a pattern or design to freshen up the front. And when you are tired of it or want to change things up, you can easily removed it and start fresh. This is a great way to jazz up a kids space as they grow. It's also a great way to get them involved in the process because it is not permanent.